The British Journal of Visual Impairment is for all professionals concerned with children and adults who have a visual impairment and is a forum for all views on related subjects. The editorial board welcomes articles of current interest on research, education, health, welfare, employment and technology. "The British Journal of Visual Impairment is a lively forum expressing current viewpoints, in an accessible form, on a variety of professional concerns. It is exceptional in that it encompasses a wide range of issues and perspectives related to visual impairment - some of these are special, some general, but all are significant." Linda Pring, Professor of Psychology, Goldsmiths College, University of London, UK. "The British Journal of Visual Impairment will provide a key platform for sharing knowledge between practitioners and researchers working in the field of visual impairment and blindness. It is vital that the impact of developments in diagnosis, assessment, treatment, management and policy is shared with and monitored by all working in this important arena." G. Morbey, Chief Executive, Sense Scotland. British Journal of Visual Impairment is available on SAGE Journals Online. The British Journal of Visual Impairment is an interdisciplinary peer-reviewed publication concerned with social research, policy and practice in relation to children and adults who have visual impairment. The Journal publishes articles on visual impairment relevant to education, health, welfare, employment and the application of technology. The journal has an international focus and seeks to publish empirical articles and scholarly comment on issues that aim to increase understanding of the potential barriers to learning and participation that may be experienced by individuals with visual impairment. Most research articles will be empirical submissions that are evidence based and data driven. They may also include scholarly articles such as reviews of research literature or contributions to theory. Research reports would normally meet the criteria for research articles but their shorter length might reflect a narrower scope: for examples pilot studies/studies with a small number of participants, or summaries of research in progress. Practice reports will include contributions from practitioners relating to innovative developments in areas such as teaching methods, curriculum development or provision. These contributions may typically initiate, or contribute to, debate on a topical issue of broad concern to the field of visual impairment and will draw upon the author's personal/professional experience. No anonymous contributions will be accepted. Please read the guidelines below then visit the Journal’s submission site http://mc.manuscriptcentral.com/bjvi to upload your manuscript. Please note that manuscripts not conforming to these guidelines may be returned. Only manuscripts of sufficient quality that meet the aims and scope of BJVI will be reviewed. Before submitting your manuscript to BJVI, please ensure you have read the Aims & Scope. The journal normally publishes four different types of article. These are listed below with approximate word length excluding references. Authors should indicate under which category they wish the manuscript to be considered. The text should be clearly organized, with a clear hierarchy of heading and subheading. BJVI operates a strictly anonymous peer review process in which the reviewer’s name is withheld from the author and, the author’s name from the reviewer. Each manuscript is reviewed by at least two referees. All manuscripts are reviewed as rapidly as possible. BJVI requires all authors to acknowledge their funding in a consistent fashion under a separate heading. Please visit the Funding Acknowledgements page on the SAGE Journal Author Gateway to confirm the format of the acknowledgment text in the event of funding, or state that: This research received no specific grant from any funding agency in the public, commercial, or not-for-profit sectors. BJVI encourages authors to include a declaration of any conflicting interests and recommends you review the good practice guidelines on the SAGE Journal Author Gateway. BJVI conforms to the ICMJE requirement that clinical trials are registered in a WHO-approved public trials registry at or before the time of first patient enrolment as a condition of consideration for publication. The trial registry name and URL, and registration number must be included at the end of the abstract. BJVI and SAGE take issues of copyright infringement, plagiarism or other breaches of best practice in publication very seriously. We seek to protect the rights of our authors and we always investigate claims of plagiarism or misuse of published articles. Equally, we seek to protect the reputation of the journal against malpractice. Submitted articles may be checked with duplication-checking software. Where an article, for example, is found to have plagiarised other work or included third-party copyright material without permission or with insufficient acknowledgement, or where the authorship of the article is contested, we reserve the right to take action including, but not limited to: publishing an erratum or corrigendum (correction); retracting the article; taking up the matter with the head of department or dean of the author's institution and/or relevant academic bodies or societies; or taking appropriate legal action. BJVI offers optional open access publishing via the SAGE Choice programme. For more information please visit the SAGE Choice website. For information on funding body compliance, and depositing your article in repositories, please visit SAGE Publishing Policies on our Journal Author Gateway. The preferred format for your manuscript is Word. LaTeX files are also accepted. The text should be double-spaced throughout and with a minimum of 3cm for left and right hand margins and 5cm at head and foot. Text should be standard 10 or 12 point. Articles must be typed, written in English and avoid discriminatory language. They should be aimed at an international audience, using a clear style, avoiding jargon. You must therefore explain points that might only be understood within your own education system. Acronyms, abbreviations and technical terms should be defined when they are first used. UK spellings are preferred. If notes are essential only use endnotes. Do not indent at the start of a new paragraph; instead, leave one line between each paragraph; and at least two lines between each (sub)section and the next. Word and (La)Tex templates are available on the Manuscript Submission Guidelines page of our Author Gateway. BJVI adheres to the APA reference style. View the APA guidelines to ensure your manuscript conforms to this reference style. 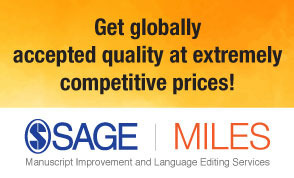 BJVI is hosted on SAGE Track, a web based online submission and peer review system powered by ScholarOne™ Manuscripts. Visit http://mc.manuscriptcentral.com/BJVI to login and submit your article online.